I often get asked about our purple moose and what it "means". When I was trying to decide on a company name I wanted to find something unique and different. While pondering this, a moose happened by and I thought what a wonderful animal. A moose is one of the few creatures that is so regal and dorky at the same time.....that's it - I'm a moose! Purple is one of my favorite colors - so there ya go - a purple moose is born! Our mission is to provide accurate and detailed patterns for quilters everywhere. We also strive to provide hard-to-find notions and tools along with standard notions at great prices. We also wish to become independently wealthy in the process. O.K., so maybe we won't become independently wealthy anytime soon, but we're having lots of fun!! 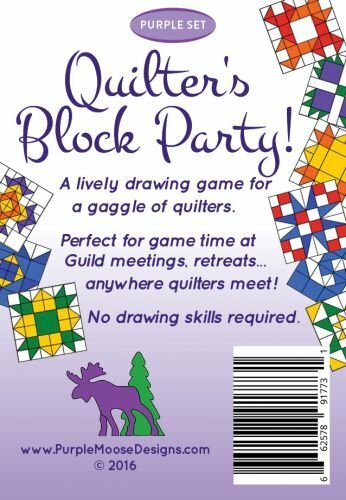 My name is Terri Sontra (aka Head Moose) and I have been quilting since the early 80's and professionally designing my own quilt patterns since 1996. I pride myself on the accuracy of the patterns. All of my patterns are tested by independent quilters to weed out any errors or problems so you can complete your project without any pesky delays. The beginner patterns are quick-to-finish designs so the beginner will feel a sense of accomplishment yet flexible enough for the more advanced quilter to enjoy also. My hubby Craig (aka Moose Geek) is my resident computer expert and handles the technical end of the business. My daughter Danielle (aka Moosette) offers me a bolt of inspiration whenever I get stuck! Together we live and work in the heart of New Hampshire!